Please Donate Dust or Money for an Independent Study to Conclusively Confirm or Refute the 2009 Paper By Harrit et al. Abstract. In April 2009, an international team of scientists published the peer-reviewed paper, Active Thermitic Material Discovered in Dust from the 9/11 World Trade Center Catastrophe. Harrit et al. isolate and investigate certain tiny red/gray chips and conclude that the red layer belongs to a novel class of energetic materials that US laboratories have been developing since the 1990´s. The federal agency responsible for the supposed investigation of the collapsed towers helped to develop this type of material and refused to look for evidence of it in the rubble. According to Harrit et al., the red layer of the chips is basically nano-thermite embedded in a resin that is most likely also energetic, and the results is an energetic nano-composite known as "super-thermite." We emphasize that Dr. Harrit is an expert in nano-chemistry and that the unusually strict review process has resulted in a solid paper that leads to the conclusion that the chips are an "active thermitic material": The team proves that the chips contain grains of iron-oxide and that they leave molten iron spheres in the residue following ignition at approximately 430°(C). One of the referees has stated in public that the paper is essentially flawless. We cover the technical debate in five chapters and explain why Dr. Millette´s unpublished report fails to provide a credible response. Your donation will pay for the completion of Mark Basile´s independent replication of Harrit´s paper. Basile is an experienced chemical engineer and his published paper will report more data than Harrit et al., including additional blind experiments by an independent lab: This new paper should definitely confirm or refute Harrit´s unchallenged conclusion. Introduction. In April 2009, an international team of scientists published the peer-reviewed paper, Active Thermitic Material Discovered in Dust from the 9/11 World Trade Center Catastrophe. Harrit et al. focus on the remnants of only one of the thermitic materials used to demolish the Twin Towers and WTC 7. The red layer of the reported red/gray chips is a novel type of energetic material that US laboratories developed in the years leading up the attacks in 2001. The paper does not report the thermate that was most likely used along with the chips of "super-thermite," or the plethora of supporting evidence that awaits your attention: Plenty of witnesses, including first-responders, have testified that explosions were seen and heard. The rubble of the towers confirms their testimonies with the tell-tale signs of spent thermitic materials - including high-temperature sulfur corrosion and tons of molten metal. Several reports mention the abundant molten iron-rich spheres in the dust, which are the trade-mark residue of these materials. The air-pollution provides further evidence, and all this is hardly a coincidence. 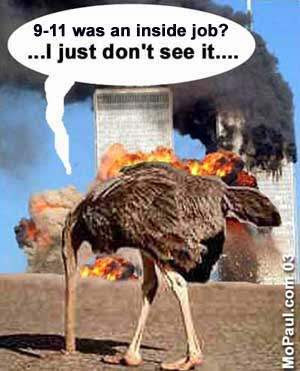 The US government agency that was supposed to investigate the collapses did not follow the standard N.F.P.A. 921 19.4.8.2.6 investigative protocol when it ignored or destroyed all the evidence and refused to look for "exotic accelerants" in the rubble. This is unscientific and also alarming since the agency helped to develop the reported material. 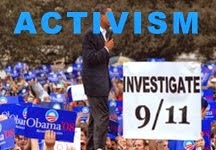 The official account of 9/11 is a cover-up, and we need a proper independent investigation. 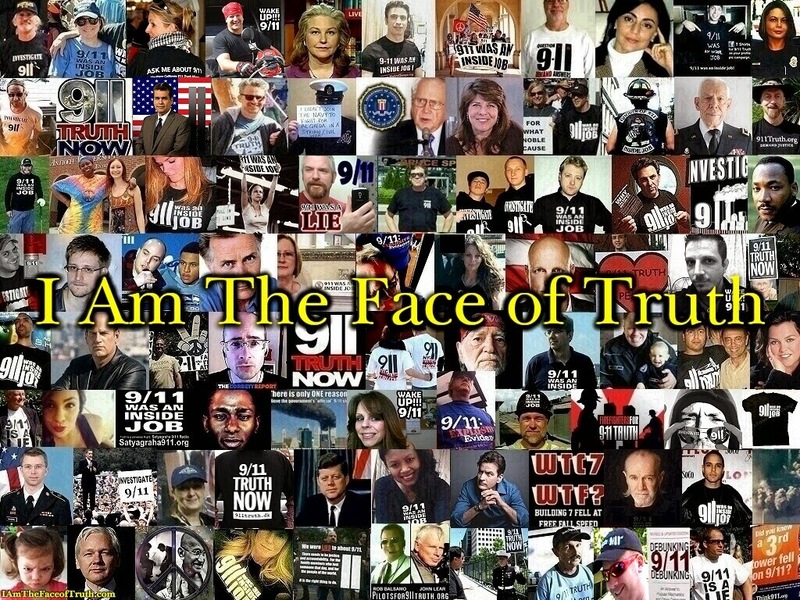 A lot of highly credentialed professionals have become aware of the situation, but many remain in the dark as became evident at the 2011 NYC premiere of the AE911Truth film, 9/11: Explosive Evidence - Experts Speak Out. According to Talboo, "an individual who held a professional engineer's license asked during the Q&A session why he had never heard of AE911Truth," and another architect "was found in tears over the terrible implications of the evidence." Dr. Harrit has a Chemistry PhD from the University of Copenhagen, where he became a faculty member and currently conducts research at the prestigious Nano-Science Center. The second author is Dr. Jeffrey Farrer, who has a PhD in Materials Science and Engineering. Farrer is the TEM lab director at Brigham Young University, where he has access to world-class equipment. The third author is Dr. Steven Jones, a Professor Emeritus at BYU with a PhD in Physics. Dr. Jones has published over fifty reviewed papers in some of the best journals, but he notes that the review process was unusually tough for this paper, "with pages of comments by referees." And according to Jones this "led to months of further experiments." The thorough peer-review is not surprising since one of the referees has publicly identified himself as Dr. David L. Griscom, a chemical physics expert and a Fellow of the American Association for the Advancement of Science. Griscom´s incredible 40 year career includes Lunar dust research for NASA, managing research for DARPA, and more than 30 years of working for the Naval Research Laboratory. Griscom has also been the principal author of well over 100 reviewed papers, and has himself reviewed at least 600 papers. Harrit et al. thank Griscom in the acknowledgement section of the paper because he had revealed his identity to them. Some people have tried to discredit Griscom´s review because of that, but there is nothing unusual about thanking an identified reviewer - some journals also allow the authors to suggest one reviewer. 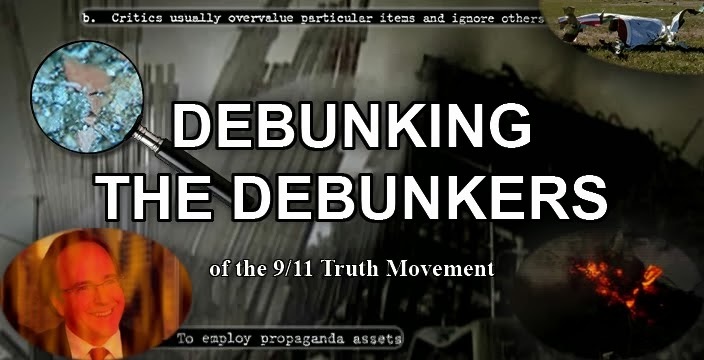 The same people have tried to discredit Griscom´s review because he does not believe the official 9/11 conspiracy theory, as the 911blogger known as "Sitting-Bull" has noted: "Some "Debunkers" already claim that he was chosen because he was a "truther". That´s totally bogus." Sitting-Bull adds that Griscom "did not play a vocal or any role in the 9/11 truth movement prior to 2007/2008," and that "Bentham surely did not find his rare blog entries on the issue for selecting him." Sitting-Bull emphasizes that Bentham must have researched "their database for valuable scientific referees in the field of research with good experience," and that Griscom would have been an obvious choice given his reputation. The "debunkers" also conveniently forget to mention that there was also another reviewer who remained anonymous, as noted by one of the authors, Gregg Roberts. Roberts states that the other reviewer "provided a much less rigorous review than did Griscom," and that this referee also approved of the paper "if the review points were dealt with adequately.." Those "months of further experiments" really paid off because Griscom states that he had "absolutely nothing to criticize in the final version of the Harrit et al. paper!" This statement resulted in Joseph Nobles´s proverbial failure at manifesting a salient retort: "And yet Griscom says that he couldn’t find anything to criticize about the ATM paper! 12 notes of suggestions he has that makes Harrit, et al. sweat and strain to meet (according to Jones), but none of these are criticisms?" The level of Nobles´s reading comprehension is embarrassing, but unfortunately it is typical for the so-called "debunking sites", such as his ae911truth.info. What Griscom actually said is that he "found absolutely nothing to criticize in the final version of the Harrit et al. paper!" You know, the final version they produced after they made the changes based on the review! Jones stated in the comments that "BYU scientists did a review of the paper" that led to changes in the report. Jones previously revealed in comments on another post that the paper was "peer-reviewed by the Physics dept. chair at BYU...because two of the authors are from this dept." Elsewhere he revealed that he was told by the chairman that the paper "was sound scientific research and that he was now persuaded that explosives/pyrotechnics were involved in the destruction of the World Trade Center on 9/11." Part I: Super-Thermite vs Paint. Jim Hoffman, an accomplished scientist with an extensive background in engineering and "scientific visualization," describes Harrit´s conclusion as "fully consistent with the observation that the Towers were subjected to controlled demolitions." Some people dismiss Harrit et al. because they have observed that the steel frames of the Twin Towers were coated in red primer-paint, and they believe that the chips studied in the paper are that primer-paint adhered to steel fragments from the WTC. Even the authors agreed that the chips could be paint before they started their research, but the paper documents comparative tests that changed their minds, including tests conducted on samples of red WTC primer-paint (pictured below) from a 9/11 monument at Clarkson College in New York. According to Dr. Jones: "The paint and the red/gray chips have a distinctly different appearance (see for example recent photos by Jon Cole which confirm this fact) and different behaviors in the MEK solvent." He states that "the red/gray chips (still wet with MEK) remained very hard, easy to pick up with forceps without deforming." Jones emphasizes that all the tested paint chips, including the primer chips, "become very flexible and limp after soaking and still wet with MEK," concluding that "[t]here can be no mistaking the distinction, despite what the JREF'ers say." Harrit et al. report remnants of the highly tailorable pyrotechnic or explosive material known as nano-thermite or super-thermite in the dust from the rubble of the WTC buildings. 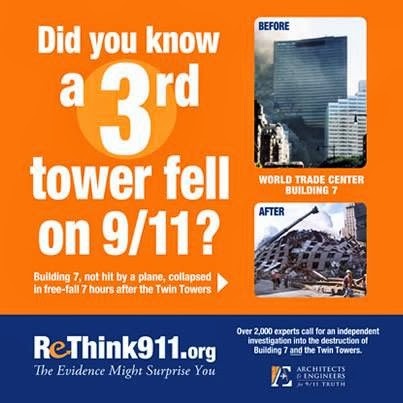 Some have suggested that clean-up crews may have contaminated the dust with thermite residues, but the authors rule out that possibility by noting that "one sample was collected about ten minutes after the collapse of the second Tower." The other donors collected their dust indoors and several blocks away from Ground-Zero, so contamination is not an issue for any of the samples. All the dust contained the same kind of chips, and the authors note that the "major dimensions" vary between "roughly 0.2 to 3 mm" for the whole chips, and that the thickness of each layer varies "from roughly 10 to 100 microns". Most of the truly tiny bi-layered chips studied in the paper weigh less than 0.7 mg, including the thermitic red layer and the inert gray layer. The red layer of the chips contains all the required ingredients (40nm thick aluminum flakes, carbon, 100nm grains of iron, and silicon), finely mixed according to a recipe that reminds the authors of known sol gel formulations of "a highly energetic form of thermite known as an energetic nanocomposite." They note that this material is also called “super-thermite,” and that it is typically "composed of aluminum and iron oxide with at least one component being approximately 100 nm or less, often along with silicon and carbon." They cite a sol-gel paper by Gash et al. (2000) , which explains that the "metal-oxide nanoparticles react with metals or other fuels in very exothermic reactions." It goes on to note that the aluminum "fuel resides within the pores of the solid matrix while the oxidizer comprises at least a portion of the skeletal matrix." It is important to understand that this "skeletal matrix" is most likely an energetic resin-base which modifies the properties of this "thermitic material", and along with the nano-technology, turns it into a novel pyrotechnic or explosive material that has little in common with traditional thermite. Harrit et al. show that the red material is a reasonable conductor of electricity relative to paint, and that it survives 55 hours of MEK (methyl ethyl ketone) paint-solvent soaking and recurrent agitation without softening or dissolving. But paint demonstrates resistance that is several magnitudes higher than the red material, and does not tolerate the same MEK soaking without disintegrating or at least becoming soft. This is expected according to the solvents and thinners info page at artsparx.com, which informs any would-be painters that MEK is "used to dissolve some of the more determined paint problems" and warns them to "test before applying MEK on any object or surface as the powerful solvent qualities of MEK can quickly damage or destroy the item." The composition is consistent with super-thermite and the exceptional paint-solvent tolerance makes it is very unlikely that Harrit´s chips are any form of conventional paint. - See Part III of this paper for more details. While the application of a thin film might have suited specific desired outcomes, it is also possible that the quenching effect of the steel the material was in contact with may have prevented a thin film of a larger mass from reacting. The fact that most of the chips have a distinctive gray layer suggests that the unreacted material was in close contact with something else, either its target, a container, or an adhesive. Fig. (13). Photomicrograph of Harrit´s MEK treated chip. Although the reported identification of a thermitic composition is perhaps conclusive by itself, some people may still remain skeptical. As Harrit et al put it: "If the material does not react vigorously it may be argued that although ingredients of thermite are present, the material may not really be thermitic." They explain that nano-thermite is in general more powerful than conventional thermite, and easier to ignite at much lower temperatures. They note that although normal thermite is an incendiary, nano-thermite is a potential explosive. Harrit et al. follow procedures established by the developers of these sol-gel materials to confirm the "active thermitic material" hypothesis: They ignite chips in a differential scanning calorimeter(DSC) to confirm that they are energetic, and analyze the ignition residues to confirm the thermite reaction. The authors also know that the active red/gray chips are as powerful as one known variant of super-thermite, because they compare the exothermic DSC curves to the result in a paper on a sol-gel nano-thermite: The red/gray chips display DSC curves that are as narrow or even narrower than the compared sample, despite the burden of an inert gray layer (see fig. 29 below). According to Dr. Farrer, "that was really a turning point for the red/gray chips for me because we got a peak on the calorimeter which shows that these red/gray chips were energetic. They were very exothermic and the width of the peak was also significant; it showed the power that the chips had. The significance of the calorimeter cannot be understated here: The calorimeter can't lie to you. If you get a sharp peak in the calorimeter, that material is energetic. The degree of its energy is determined by the height of the peak and the power at which it goes off is the width of the peak." According to Harrit´s paper, the tested samples of paint displayed a completely different behavior in the DSC: As Farrer states in the interview, "[y]ou may get a minor exothermic peak but it is not energetic. It is a very smooth wide peak and it is certainly not an energetic material.."
Fig. 29 in Harrit et al., labeled "DSC trace of sample 1 (blue line) compared with DSC of xerogel Fe2O3/UFG Al nanocomposite (from Tillotson et al. ). Both DSC traces show completion of reaction at temperatures below 560ºC". This figure confuses Chris Mohr, the leader of the JREF "debunkers", because he assumes that Harrit´s samples cannot be super-thermite because the DSC curve is not identical to this one particular Tillotson sample. But Mohr does not understand that this figure is only meant to show that Harrit´s chips match the sharp DSC peak of a known super-thermite. And as Farrer emphasized in the interview, paint does not even come close to matching this performance. Mohr does not understand either that different compositions and size-variations of the ingredients alter the ignition sensitivity, the ignition-point, the energy density and the power of the product: Harrit´s chips are not the same variation as Tillotsons´s sample so they should not perform the same way. The "debunker" known as Oystein claims that figure 29 is invalid because Harrit et al. ignited their chips in air while Tillotson et al. ignited in inert gas. Although Tillotson et al. may have used inert gas for that particular report, they did their tests in air for other reports that Harrit et al. cite, so the air-test method is valid. The conclusion of the comparison also remains valid because the material that Tillotson tests in that report contains very little organic material, so it does not need oxygen to work properly. Traditional thermite does not need external oxygen to work, but we don´t know if that holds true when the thermite is embedded in an organic material, as is the case with Harrit´s chips. Oystein implies that the presence of air and an organic material proves that there is no thermite reaction, only conventional air-combustion, but that is total non-sense as we shall see in part II about the signature molten spheres of reduced iron. Oystein also states that Harrit´s chips cannot be any type of thermite because they release way more energy than traditional thermite, which tops out at 3.9 kJ/g, but Harrit et al. cover this subject in the paper. According to them this fact "is striking," but they "suggest that the organic material in evidence in the red/gray chips is also highly energetic, most likely producing gas to provide explosive pressure." Their suggestion matches the available description of a sol-gel "super-thermite" that is mostly an energetic skeletal matrix with embedded iron-oxide and aluminum (nano-thermite). The dominating energetic matrix can have a much higher energy density, so the overall output is not limited to the density of the embedded nano-thermite. Harrit´s chips produce as little as 1.5 kJ/g if there is a large mass of the inert gray-layer present, and as much as 7.5 kJ/g if there is very little gray-layer present. Oystein still claims that the 7.5kJ/g energy density does not make sense because of the inert gray layer, but he bases that on the false assumption that the gray layer weights the same as the red one in every instance. This leads Oystein to erroneously surmise that the red layer would actually have to release way more than 7.5 kJ/g to compensate for the inflated estimate of the mass of the gray layer. Harrit et al. also note that, "[a]s this test was done in air it is possible that some of the enhancement of energy output may have come from air oxidation of the organic component." Oystein forgets that he has another article with a quote from one of the developers of these energetic sol-gel materials (co-author of the paper cited in figure 29 above) confirming that burning the organic matrix in air will "greatly add to the energy release." Although the Harrit et al. effectively rule out paint and confirm the presence of a powerful energetic material, they still have to prove the "thermitic" part of the "active thermitic material" hypothesis. - Kminek states that, "[i]f Sunstealer is right, those shiny spheres with metallic luster could be just molten iron oxides from [the gray layer of the chips]," but Kminek agrees that there is no scientific explanation for how the DSC, at 700°(C), could have produced the spheres at less than half the required temperature. Basile has also experimentally refuted Sunstealer´s hypothesis, as noted above, but some people tend to forget about inconvenient "details" like that. - Dave Thomas has proclaimed that the notion of melting-point depression explains the molten state of the spheres, because nano-sized particles can have a lower melting-point. But this phenomenon only applies to particles that are much smaller than the iron particles in the chips and the observed spheres, as a commenter on Oystein´s blog has noted. Mr. Thomas has also made a hilarious video where he ignites steel wool to produce molten iron-oxide spheres, thinking they are the same thing as the reduced iron spheres that Harrit et al. observe in their paper. To his credit, Oystein exposes the experiment by noting false premises such as the replacement of the 700°(C) DSC with a gas lighter capable of very high temperatures, and the production of the wrong kind of molten (iron-oxide) spheres. Thomas also manipulates the experiment by blowing air into the wool, simulating a blast furnace, and combined these three errors constitute a scientific blunder. Ironically, Mr. Thomas is quite the charlatan even though he is a member of The Committee for Skeptical Inquiry(CSI), whose mission is to "promote scientific inquiry, critical investigation, and the use of reason in examining controversial and extraordinary claims". - Most "debunkers" have failed to understand that the reduced iron spheres are the signature product of thermite, while they are the polar opposite to the iron-oxide spheres that conventional combustion would lead to at very high temperatures. Conventional combustion does not lead to reduced iron, but given very specialized circumstances, a 2000°(C) blast-furnace can actually reduce iron-oxide into an intermediate product called pig-iron. Although it is true that low-temperature methods exist that can reduce iron-oxide, these methods do not help the "debunkers" since they will obviously not provide molten iron. A 1100°(C) bloomery-furnace can for example produce an intermediary product that is similar to pig-iron, but it is not molten iron. And given the required special conditions that have nothing in common with the red/gray chips igniting at about 415°(C) in a DSC that tops out at 700°(C), none of these options have any relevance. As Frank Legge puts it: "The idea that you could heat a little kaolin and coke and iron oxide to a mere 400 deg C and see it suddenly run away and produce molten iron is clearly a fantasy." - Chris Mohr likes to peddle an incredible story involving hurricane winds producing the spheres found in the dust collected at the WTC, but skeptics have refuted that fairy-tale. Even Oystein admits it, stating that, to some extent they "made up" a "vivid story", and in another comment he says, "on the science and the details, their story... is almost certainly nonsense." Mohr also fails to understand that even if it were not non-sense, the hurricane theory would not explain why the red/gray chips produce those same spheres in a DSC. The molten spheres in Harrit´s dust samples and the residue of the ignited chips are obviously not the result of steel-cutting clean-up operations at the WTC, because the dust had been collected before those operations started and the chips also make new spheres upon ignition - and the steel-cutting torches produce iron-oxide spheres anyway. ScootleRoyale´s excellent September 2011 article points out that the iron spheres are not fly-ash from WTC concrete, because no-one has confirmed the presence of fly-ash in that concrete - and in fact Steven Jones notes that they did not find any spheres when they crushed samples of WTC concrete in one of their experiments. The article also points out that the composition and morphology of fly-ash is not consistent with the reported spheres, and notes the presence of some peculiar spheres that are also in the dust: Notice the presence of sulfur in some of the spheres, and click here and here for more information about the thermate that was most likely used along with the super-thermite. The only remaining explanation for those molten iron spheres after chip-ignition at about 415°(C) in a DSC that maxed out at 700°(C), is thermitic activity. Dr Jones notes that Oystein has admitted to him that, "I don't know why you found this or that kind of spheres in the residue.” In response, Jones states that: "We explain in our paper how these experimental observations provide evidence for the thermite reaction. Thanks for this admission-- and note that the presence of iron-rich spheres in the residue has been verified by Mark Basile in his studies of the red-gray chips." Fig. (20). "Photomicrographs of residues from red/gray chips ignited in the DSC. Notice the shiny-metallic spheres and also the translucent spheres. Each blue scale-marker represents 50 microns." Part III: Dr. Millette´s failure. Harrit et al. state that, "To merit consideration, any assertion that a prosaic substance such as paint could match the characteristics we have described would have to be accompanied by empirical demonstration using a sample of the proposed material, including SEM/XEDS and DSC analyses." No-one has been able to do that, but Chris Mohr from the controversial JREF-911forum claims that they have funded an independent scientist to publish a study that will replicate the paper, and meet the challenge for a prosaic substance: James R. Millette, Ph.D., of MVA Scientific Consultants, published a preliminary report in March 2012, that is supposed to refute the findings of the 2009 paper. It concludes that "[t]he red/gray chips found in the WTC dust at four sites in New York City are consistent with a carbon steel coated with an epoxy resin that contains primarily iron oxide and kaolin clay pigments." In other words, Millette claims that the chips are a prosaic substance in the form of paint adhered to fragments of steel. This is a request for an investigation by the Senate Subcommittee on Superfund and Environmental Health into the falsification of pH corrosivity data for World Trade Center dust. This corrosivity is attributed to be one of the causative agents in current respiratory disabilities and/or deaths of first responders, recovery workers, laborers, residents, and office workers. - According to Millette, his chips are primer paint from the WTC, but he has not matched them to any primer paint that was specified for the Towers. NIST studied the Tnemec primer-paint that coated the steel frames of the Twin Towers, but Harrit rules Tnemec out in a paper dedicated to this issue in particular. Harrit notes that Tnemec displays "strong signals" for zinc, chromium and magnesium, while their red/gray chips lack signals from those elements "in intensities significantly above the baseline noise." Coincidentally, Millette agrees in his preliminary report and also eliminates Tnemec as the source for the chips because, "..none of the 177 different [Tnemec]coatings are a match for the red layer coating found in this study." Harrit adds that another reason to rule out Tnemec is the fact that it does not ignite given the same temperature as their chips: "Notice, that the primer paint – being basically a ceramic material – is chemically stable at temperatures up to 800 C."
- Millette´s sponsors have responded by noting that another type of primer-paint, called LaClede Standard Primer, may have coated the steel floor-trusses of the Twin-Towers. But as Sitting-Bull observes, this theory is seriously flawed because Oystein bases his computer generated spectra for LaClede on his own assumptions about the paint composition and the cured product, not an actual sample. And LaClede has proven to be another dead-end anyway, because even this ASSUMED chemical composition is not consistent with the chips either, no matter how promising it initially may have seemed: Although LaClede does have many of the same ingredients as Harrit´s chips, the quantities do not match so the composition does not match. And ironically, Farrer´s unpublished TEM analysis shows tiny amounts of strontium and chromium in Harrit´s chips, but Millette´s TEM analysis fails to identify those two LaClede ingredients in his chips. Chris Mohr and Oystein have already acknowledged this problem, as Mohr so succintly put it: "It was clear to me that [Millette] looked and he did not find it. I wouldn't bet my nuts on it being LaClede." Finally, if these gentlemen ever find confirmed samples of LaClede for comparative testing, we predict that they would discover that this paint does not remain hard after soaking for more than fifty hours in a paint-solvent, and that it would also fail to match Harrit´s chips in the ignition tests. James Millette did NOT do DSC analyses at all for his report MVA9119. What a shame, really...When Dr. Farrer burned epoxy paint in the DSC, it gave a very broad thermal trace, NOT at all like the spiked exothermic DSC peak in our Fig 19. This is one of the many tests he did to check things. Also, we checked the electrical resistivity of several paints – consistently orders of magnitude higher than that of the red material. We reported the resistivity of the red material in our paper, page 27 in the Journal. Millette did not report any electrical resistivity measurements. This measurement is rather easy to do so I was surprised when he failed to do this straightforward test. There is a lot of red material of various types in the WTC dust, so one must be careful to make sure it is the same as what we studied, and not some other material. - Dr. Millette also chose to analyze samples that soften when soaked in organic solvents, even though Harrit et al. clearly state that with their chips, "a hard silicon-rich matrix remained after this procedure." Given the fact that Ryan warned Mohr about the presence of different kinds of chips in the dust, Millette´s conduct seems sloppy at best. Jones emphasizes that "the red material swells but remains hard under forceps after soaking for many hours." Dr. Jones also notes that Millette´s TEM analysis shows that his samples contain titanium but no lead, while Harrit et al. have unpublished TEM analysis demonstrating that their chips have traces of lead but no titanium. His conclusion: "More and more, it appears that Millette was simply not looking at the same material that we studied". - According to Harrit et al., when they heated paint samples as well as the thermitic red chips with an oxy-acetylene torch, the paint samples "immediately reduced to fragile ashes" while the active red/gray chips ignited and "the high-speed ejection of a hot particle was observed under the hand of the person holding the torch." The authors go on to state that "[t]he intense light and bright orange color of the particle attest to its high temperature," and that "the formation of iron-rich semi-spherical shapes shows that the residue had been melted, enabling surface tension of the liquid to pull it into spherical shapes." Basile agrees in a radio-interview and states that when the active red/gray chips ignite, "they burn, there's a white flame that goes on, on the inside of the chip - you can actually see the light coming through the chip as it's consumed...There is iron droplets and there is actually iron films that get produced all through the remaining matrix once the chemical reaction has occurred." - Mark Basile´s ignition experiments reveal why Millette avoids the ignition test: If Millette is investigating the same chips as Harrit and Basile, the ignition result would reveal the molten iron spheres and most likely Millette´s inability to explain them without confirming the "active thermitic material" hypothesis. And if Millette is in fact studying the wrong chips as we suspect, the ignition test would also reveal that fact by exposing the inactive chips, and invalidate Millette´s paper. Another way of spotting Millette´s transparent failure to address Harrit´s challenge for a "prosaic substance," is realizing that if paint could actually replicate the active chip ignition results, Millette could refute Harrit´s paper with a simple demonstration of some known type of paint igniting with a flash and leaving molten iron spheres. As one commenter on a forum asked, "Do you think Millette et al. can swing a few bucks for an oxyacetylene torch, a graphite block, and a pair of tweezers?" Similarly, John-Michael stated on May 3rd 2011, "Of course 'debunkers' could easily prove the paper wrong, in part, by simply getting an oxy-acetylene torch and burning up some primer paints." They have not carried out any such experiments, but Mark Basile has tested three samples of confirmed paints, including a sample of WTC primer-paint: Basile heated all samples beyond the ignition point of the active red/gray chips, but none of them even ignited - so obviously the paint chips are hardly capable of leaving molten metal spheres of any kind, see video below. - Talboo notes that another independent researcher has indicated that it is most likely also possible to find the right chips (or remnants of them) in inactive or partially reacted form. The only chips this researcher had for the ignition test may have been inactive, as Henry-Couannier himself states: "So, maybe, the red-red chips are just fragments originating from red-grey chips that already reacted at the WTC and for this reason cannot react anymore." Henry-Couannier did not resolve this problem or publish his study, which is a pity because he confirms in his preliminary report that the composition of the red/gray chips is consistent with a thermitic material. - The red layer of Millette´s chips is not the only mismatch to the bi-layered chips reported by Harrit et al., because the gray layer does not match either. Oystein has acknowledged this problem in an article, although he does note that one of Millette´s samples may have a similar gray layer. According to Oystein, Millette´s gray layers are "different steels on account of their Al-content and probably too high carbon content." Oystein seems to think that all the chips have an oxidized gray layer like Harrit´s chips, but Millette disagrees and characterizes the gray layer as "consistent with a carbon steel." One of Harrit´s co-authors has also noticed this problem and stated that the gray side of their samples "is not metal but is an oxide." According to Legge this is another invalidation of Millette´s report: "No point in looking further." - Kevin Ryan has also concluded that Millette´s supposed refutation of their paper may have been invalid from the start, because Millette is most likely not testing the same material: "Steel primer paints must be resistant to fire and withstand temperatures well over 700 C, so we know that the diversionary claims about primer paint are not true...Millettte’s samples “ashed” at or below 400 C and therefore are not only not red/gray chips (which ignite at 430 C and form spheres identical to those from thermitic reactions) but are also not primer paint from the WTC. But he pretty much admits that." Fig. (31). Photomicrograph of a red/gray chip found in sample 3, showing multiple layers and an unusual light-gray layer between the red layers. Part IV: The Elemental Aluminum. So, how does Dr. Millette justify the lack of replication? He essentially states that further testing is unnecessary because there is "no evidence of individual elemental aluminum particles of any size in the red/gray chips, therefore the red layer of the red/gray chips is not thermite or nano-thermite." Millette claims that the plates of silicon and aluminum inside the chips are kaolin, which is a clay material that happens to be a common ingredient in paints. But as we have previously noted, Millette is probably not studying the same material as Harrit et al. - and in this case Millette may have found kaolin because he is focusing on the paint chips also present in the dust, despite Kevin Ryan´s specific warning (see part III). Kaolin plates may look very similar to coated aluminum platelets, but Millette finds kaolin plates as thin as 6 nm while Harrit et al. report consistent platelets "approximately 40 nm thick." Millette and his sponsors should have known that they could expect to find the aluminum in the correct chips hidden inside a protective coating based on silicon. They have failed to read the excellent references that Harrit et al. cite, including this one which explains that the coating is "essential to protect aluminum nanopowder.." and that it "leads to better dispersion...and more uniform mixing." The protective layer not only promotes efficiency, it also prevents air-oxidation and humidity from deactivating the elemental aluminum, which explains how the chips could remain active for so many years. Harrit et al. agree that their chips contain aluminum and silicon together in the same space, but how do they determine whether or not the two chemicals are separate or chemically bound together as kaolin? As we note in Part II, when you compare the signals for Al/Si before and after ignition, you see that the peaks no longer have the same ratio after ignition and that the aluminum is relatively depleted, which is not consistent with a compound. And the team discovered that MEK paint-solvent induces swelling in their chips that segregates the silicon from the aluminum, which proves that they are not chemically bound together, so the plates in their chips are not kaolin. This is confirmed with chemical analysis and clear visual representations, but the "debunkers" ignore this important result. They claim that the main chips studied (chips "a to d" depicted in fig.7) are LaClede primer-paint that contains kaolin, and that the MEK chip is another type of paint (Tnemec) that does not have kaolin. Adam Taylor notes in his March 2011 article that the source for this MEK hand-wave is Sunstealer´s March 2011 post where he announces that the XEDS spectrum for the MEK chip (fig.14) looks very similar to the spectrum for Tnemec primer-paint. But as Taylor explains, the XEDS spectrum for the MEK chip represents the unwashed and contaminated surface, while the spectra for the other chips represent clean surfaces. The contaminants happen to make the unwashed MEK chip look like Tnemec, but Sunstealer´s rationale is essentially pretending that there is no contamination. ScootleRoyale´s excellent March 2012 article also demolishes Sunstealer´s premise for this theory, because the unwashed surface of all the studied chips had a spectrum similar to the unwashed MEK chip according to one of the authors of the study, including the chips featured in the paper (in figure 7). ScootleRoyale also demonstrates to Oystein how untenable the MEK hand-wave is by noting the fact that the MEK solvent does not dissolve or soften the chip, unlike confirmed Tnemec chips: "The reason Harrit et al. soaked a chip in MEK was to compare the result to Tnemec primer!" Talboo and Weathers also demonstrate in their May 2011 article that Sunstealer´s MEK Hand-wave is an obvious failure because there is no elemental aluminum in Tnemec, only aluminum bound to calcium. Tnemec also contains zinc, but the MEK chip only has Zn and Ca as surface contaminants which disappear after the wash in the MEK. Talboo and Weathers respond to Oystein´s objections to Taylor´s article, including his claim that Harrit et al. simply could not register Zn and Ca with their equipment settings for the recorded spectra after the MEK soak. Unfortunately for Oystein, his fellow JREF´er has debunked his claim and confirmed that Harrit´s equipment would have registered the Zn and the Ca. Talboo and Weathers also note that Dr. Farrer debunks Oystein´s claim that they mislabeled Zn as sodium(Na). According to Farrer, the sodium "peak that is found in fig 18 was confirmed by the absence of the Zn k-alpha peak at 8.637keV (and yes, the same exact spot was analyzed at a beam energy of 20kV and the Zn k-alpha peak is still not present)." Farrer goes on to say that "while it is true that the Na k-alpha peak (1.04keV) overlaps the Zn L-alpha (1.012keV), it is pretty simple to confirm which element is present." Look, Oystein, why don't you put a sample of Tnemec primer in MEK and soak it, and see whether it becomes limp (as I say) or remains very hard under forceps? Do debunkers ever do experiments? I say, do the experiment and let us know what you find! Experiments are much more convincing in science than hand-waving arguments. Denis Rancourt has suggested that the XEDS sample-holder provides the aluminum signal, but Harrit notes that their control experiments prove that "the electron beam couldn’t even penetrate the carbon conductive tab used as substratum..." In other words, "the Al/Mg scaffold was never hit in any of the spectral recordings published in the article." Harrit also mentions that they have unpublished TEM analysis where "the samples were mounted on a copper holder and these measurements also confirm the presence of aluminum." According to Dr. Jones, their unpublished analysis via TEM and XRD is consistent with their previous (MEK test) conclusion of ruling out kaolin, but he notes that the new tests have not resulted in conclusive identification of pure aluminum - According to Jones, the aluminum might be in an amorphous form that is difficult to detect. Part V: The FTIR Data. The final problem with Millette´s paint-hypothesis is that even if he could prove that he has the correct red/gray chips and that they contain paint-epoxy, that would not rule out thermitic materials. Sunstealer reports a paper that investigates thermitic materials diluted with standard epoxy (up to 50% by weight epoxy and 80% by volume), so there is actually such a thing as functional nano-thermite embedded in a conventional epoxy matrix. This reference certainly refutes Millette's contention that finding normal epoxy mixed in with the chips would rule out the "active thermitic material" hypothesis. Millette´s promoters insist that the report´s red/gray chip FTIR spectrum confirms their paint hypothesis, but they keep reaching premature conclusions due to lack of research. In a comment on Oystein´s blog, Kminek lists the salient points of Millette´s FTIR data, but although Kminek finds the data to be consistent with paint, he also notes that "[t]his is of course not really conclusive finding.." Zugam agrees that the spectrum is not conclusive, reminding Kminek that it is possible to find thermite embedded in conventional epoxy, so the identification of an epoxy spectrum would not necessarily resolve anything. Zugam also points out that the proposed match to Millette´s chosen representative epoxy spectrum is not that good, and suggests that the sol-gel matrix might leave a similar spectrum in cases where a high organic content is retained after processing. Most people notice right away that Millette´s FTIR spectrum is not consistent with Ryan´s spectrum, which may spell "the end" for the credibility of Millette´s report, since this is another clear indication that he is not studying the right chips. Basile´s investigation should resolve this issue once and for all, because he knows how to isolate the right chips and his paper will also include FTIR data. According to Mattos et al. (2009), in general we establish the presence of the carbon-fluorine groups by detecting the "intense absorptions" within the range of 1397 – 1074 cm-1. 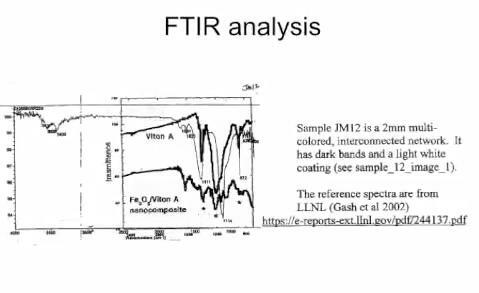 Ryan compares his FTIR spectrum to an example from Gash et al. (2002), which is the same FTIR report that Harrit et al. mention in the paper. In this report, Gash et al. state that, "[t]here are clear strong vibrational bands at 883 cm-', 1205 cm-I, and 1398 cm-' in the spectra of both materials (note asterisks in Figure 2). This is plain evidence that the synthetic process described above has resulted in a sol-gel Fe2O3 material that contains Viton." Mattos et al. also mention a characteristic band at 890 cm-1, and Ryan´s spectrum does have a band in that approximate location as well. Keep in mind that Ryan is not attempting to establish that he has exactly the same material as Gash et al. ; instead he is attempting to confirm the common fluorine ingredient. Kevin Ryan´s video does not go into any details, but judging by the description of sample "JM12", it is one of the chips with the multiple, stacked layers. To be fair, we must note that Ryan does not specifically state that this spectrum represents the typical red layer in Harrit´s paper, so one could speculate that this spectrum actually represents some other layer or "the light white coating." Ryan´s unpublished data therefore does not conclusively identify a fluorine compound in the red layer, even though it may confirm such a compound in or on some layer. Ryan´s video demonstrates his own home-made version of the active red layer, which is based on the sol-gel method to make a nanothermite embedded in a Viton infused matrix. 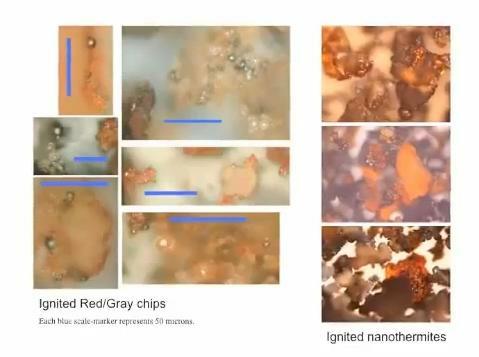 The result is a material that is very similar to the red layer of the red/gray chips, as you can see in Ryan´s 26 picture slide show: Half of the images show his nano-thermite after ignition while the other half demonstrates remnants of ignited red/gray chips extracted from WTC dust samples. Notice that both examples leave molten spheres, and both retain some red coloration because there is still some unreacted iron-oxide present. Can you tell which ones are which? Discussion. The 2009 super-thermite paper by Harrit et al. is based on extensive research by highly experienced experts with impressive credentials. We report in our introduction that the paper survived an unusually strict peer-review that led to "months of further experiments." This process included a formal review by two referees working for the publisher, and an informal internal review by the university that employs two of the authors. We also introduce the reader to the desperate tactics the "debunkers" have relied on to slander the publisher, the paper, the authors and even one of the referees. And in the end we demonstrate that these people have resorted to this behavior because they cannot refute the actual evidence that Harrit et al. present in the paper. The chip-composition alone could perhaps prove the "active thermitic material" hypothesis, but the sharp exothermic DSC ignition peaks and the expected molten iron spheres are the compelling evidence that leads to the inescapable conclusion. Harrit et al. directly challenge skeptics to publish a paper that demonstrates another type of material that matches their observations, but so far no-one has documented any "prosaic substance" that can replicate the ignition results. Numerous self-proclaimed "debunkers" have attempted to discredit Harrit´s conclusion with authoritative statements and gossip on internet forums, but we have shown that those unpublished exercises in hand-waving tactics have no validity in the real-world. Most of these people fail to understand the significance of the fact that the molten iron spheres are not iron-oxide and therefore not the result of conventional combustion. The active red/gray chip start out with grains of Fe2O3, but they actually end up post-ignition with Fe:O ratios of up to 4:1 in the molten spheres. Reverend Chris Mohr hired Dr. Millette to replicate and refute Harrit et al., but Millette does not even attempt to address the ignition result in his unpublished 2012 preliminary report. And Millette´s sponsors have admitted that no-one has even heard of a paint capable of producing molten iron spheres of any kind, let alone molten spheres of reduced iron; Dr. Harrit´s conclusion therefore remains unchallenged, and the fact that Basile has independently verified those signature iron-rich spheres makes it very convincing. Dr. Jones, Dr. Legge and Kevin Ryan have commented on Millette´s supposed challenge to their 2009 paper, and pointed out that Millette´s report most likely suffers from another major flaw that completely invalidates it: Millette is probably not even studying the correct red/gray chips, despite Ryan´s clear early warning to Mohr about the presence of other kinds of red/gray chips in the dust. Millette knew from the start that the dust contains mundane red/gray paint chips as well as the suspected red/gray nano-thermite chips; yet he chose to ignore several tests that Harrit et al. use to characterize the correct chips, and to study chips that soften in paint solvent. We suspect that Dr. Millette is refusing to replicate the ignition testing because he is aware of his mistake, and that this testing would expose his inactive and incorrect chips. What I’ve noticed is that Millette’s approach looks much like that of NIST over the years – a fishing expedition. That is, NIST spent many years putting out hypotheses in a way that asked the public: “will you buy this?” NIST then abandoned most of those hyptheses (e.g. core column shortening, diesel fuel fires) after collecting the public responses. In what is described on the JREF forum as "the first truther's article reacting to Jim Millette's study", John-Michael outlines what tests should be done by Millette for his then still unreleased report, stating that "if all of this is done" then "the original study" could be "effectively debunked." - It wasn't. As Zugam concludes, commenting on the blog of Millette´s most passionate fan: "Dear Oystein, if you are going to prove that the chips are [Tnemec] and/or [LaClede] paints, then you have to demonstrate that samples of these paints behave in the same way as the red/gray chips when tested." He goes on to explain that the samples should ignite and replicate the DSC peaks at about 430°(C), "and leave molten metal spheres after ignition." Zugam wraps up the situation by repeating a paraphrased version of Dr. Jones´s public 2009 challenge to "debunkers": "We cannot seriously consider the paint hypothesis until someone performs these seemingly easy tests and publishes the results" - and still we wait. - Red/gray chip separation using optical microscopy and magnetic attraction to assist in isolation of particles of interest. - Optical images of collected particulates as collected at appropriate magnifications to record condition as collected. - SEM/EDX with elemental quantification of red/gray chips, both red and gray layers. - FTIR analysis of organic components of red/gray chips, both red and gray layers. - ESCA small spot technique with argon ion sputter for depth profiling to definitively establish the presence of elemental aluminum within the red layer of the red/gray chips. Scans of gray layer also to be taken to add to information base. - DSC analysis of red/gray chips focusing on exothermic/endothermic reactions near 400 degrees C. Some chips to be scanned in inert atmosphere and some in air or oxygen containing gas stream. - SEM/EDX with elemental quantification of residual products of DSC analysis of red/gray chips. - Optical images of reaction products after DSC experiments. Analytical Costs: The following work is in need of funding to be run at independent facilities. -ESCA costs are $330 per hour and a total of 4 to 8 hours is desired. This should allow for evaluation of at least two known thermitic red/gray chips with some sputtering for depth profile information as well. Special thanks to Angela Garris for research help with the updated version.